The GBC ProClick P2000 is perfect for offices or production environments that already have a Pro-Click Pronto or 3:1 wire die pattern – as it is a binding only machine without punch capabilities. Super quick binding is achieved by inserting your document/booklet into the P2000’s front slot to ensure you have the proper diameter ProClick cassette installed. An easy to see light in the top inserter slot allows perfect alignment on every book. Once loaded, just press the Bind button and your book is professionally bound in only 6 seconds! Thanks to the intuitive LCD control panel that walks you through every step, even first time users can walk up and bind booklets with ProClick spines easily and quickly with virtually no training. See just how easy it is in the video below. Got a question about the P2000 or ProClick binding? Ask away in the comments below or feel free to contact CFS. 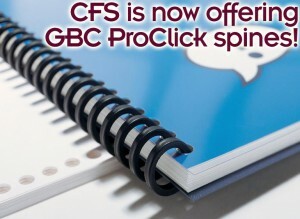 GBC ProClick Spines Just Added! 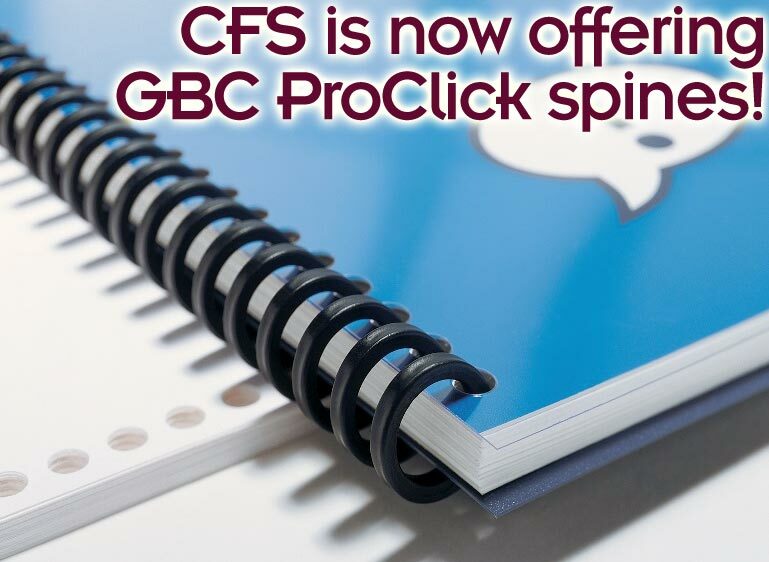 We’ve had several requests in the past for GBC ProClick spines and now we can proudly say, “Sure, we can get those to you!” Both the loose ProClick Easy-Editing spines and the ProClick Pronto cartridges are now available from CFS. What is ProClick you ask? 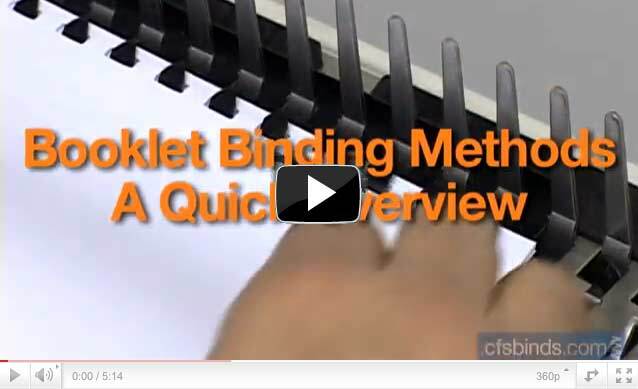 It’s a binding method developed by General Binding Corp that allows you to open and close it for editing your booklets without the need for a machine. To me, it looks like a hybrid cross between plastic comb and double loop wire binding. Each of the 32 rings that pass through your pages is hinged and has a concealed locking tab that, well… clicks together. Conveniently, almost as if by design, ProClick splines fit the standard 3:1 pitch, 32-hole punch pattern created by double loop wire binding machines. 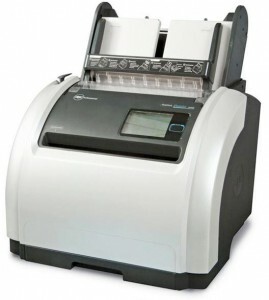 In the next few days we’ll also be adding ProClick binding machines by GBC to help speed along your ProClick booklet binding. Got a question about this binding method? Ask away in the comments below, we’d love to hear from you. 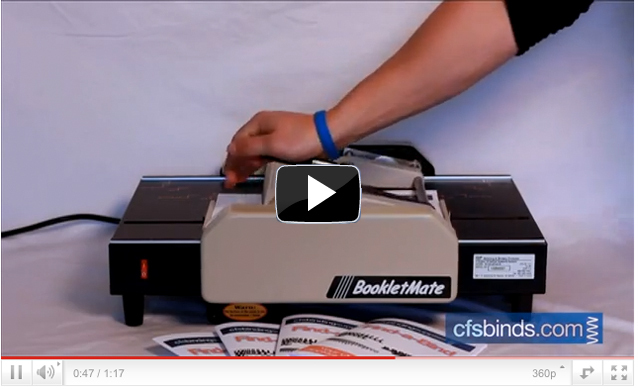 Also check out the BookletMate on our website to see specs and learn more!